NEW YORK, Aug. 2, 2018 /PRNewswire/ — Ultimate Beverage Challenge 2018, one of the world’s three most authoritative spirits competitions, recently concluded with leading liquor brands from all over the world, including Martell, Johnnie Walker, Chivas Regal, Yamazaki, Moutai and Jiannanchun (JNC), among others, having been evaluated. The competition is considered as the Olympics of the liquor industry. Leading Chinese liquor brands JNC and Moutai were given special recognition by the judges for the fine quality of the liquor. 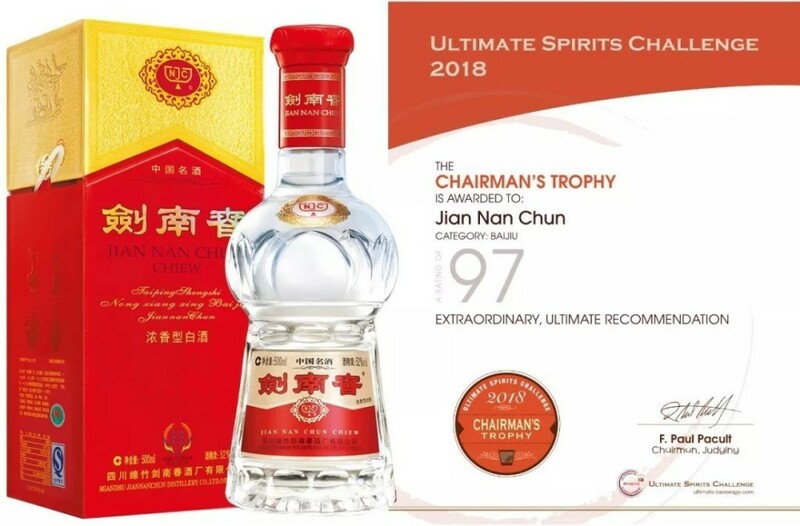 Moutai won the Finalist award with a score of 96, while JNC, rated at 97, was awarded the highest honor of the competition, the Chairman’s Trophies. Ultimate Beverage Challenge is an annual non-commercial professional tasting competition held in New York. The judging panel consists of representatives from authoritative organizations and professionals in the industry designated by the organizing committee. The rigorous science-based evaluation process, which lasts for two to three months, covers sample delivery and the blind taste test followed by a phased evaluation process. What the judges taste is just a glass of liquor regardless of the packaging and brand. The entries are rated based on a precise and fully validated evaluation process. The key to succeeding in the competition, in which the world’s most reputable brands participated, including Martell, Chivas Regal, Johnnie Walker and Yamazaki, depends entirely on the quality of the product. China-based liquor maker JNC, a leader in the Chinese fragrant liquor industry, impressed the judges with the quality and style of its products. The success at the Ultimate Beverage Challenge 2018 has gone far in raising the awareness of the JNC brand worldwide. Professionals and liquor aficionados clamored to know more about the liquor maker who took home the highest honor. Chinese Brands Rank as Most Valuable and Fastest-Growing Drinks Brands What’s baijiu, and where does its unique flavor come from?